Regular readers might recall that back in October, I visited the Bluebird Tea Co for a tea blending workshop. While there I somehow dropped my debit card into the card machine and all my money fell out in exchange for tea, and I still have no idea how it happened. 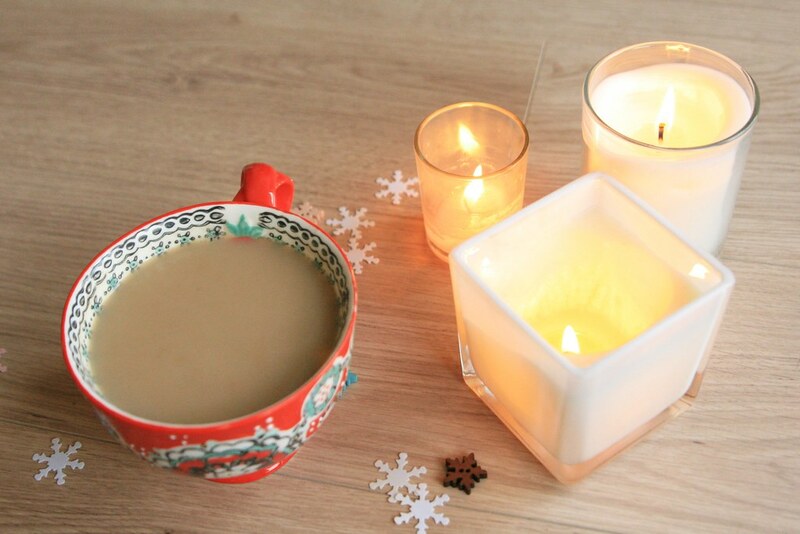 One of the things I came home with was some gingerbread rooibos chai, which smells divinely of Christmas. 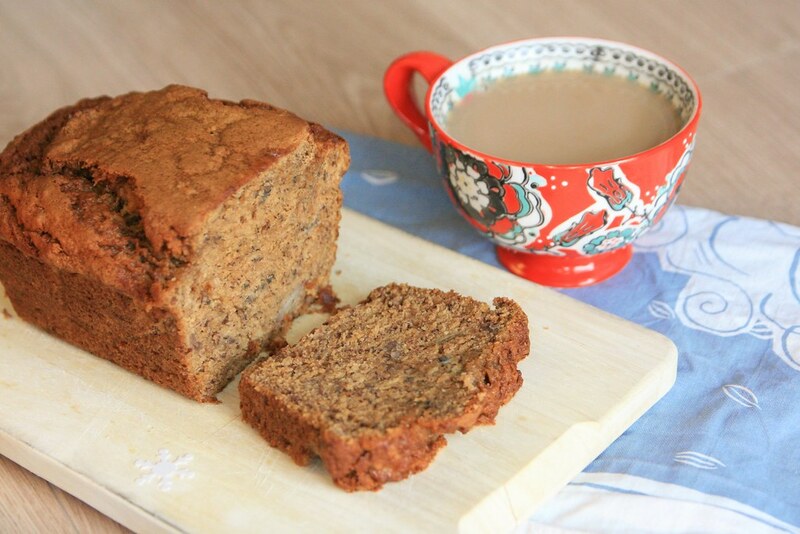 Perusing the excellent Bluebird Tea Co website, I found a recipe for chai-infused banana bread that was calling my name, and I had no choice but to put some of my newly purchased tea towards this very worthy cause. You can find the recipe here and it worked very well indeed; I will certainly be baking this again! The trick to the recipe is that the milk is gently heated with leaf tea for 6-8 minutes which makes all the lovely flavours insinuate their wicked way into the liquid. Then hey presto: you strain out the tea and when you mix up the cake, all the flavours in the tea get mixed up too. 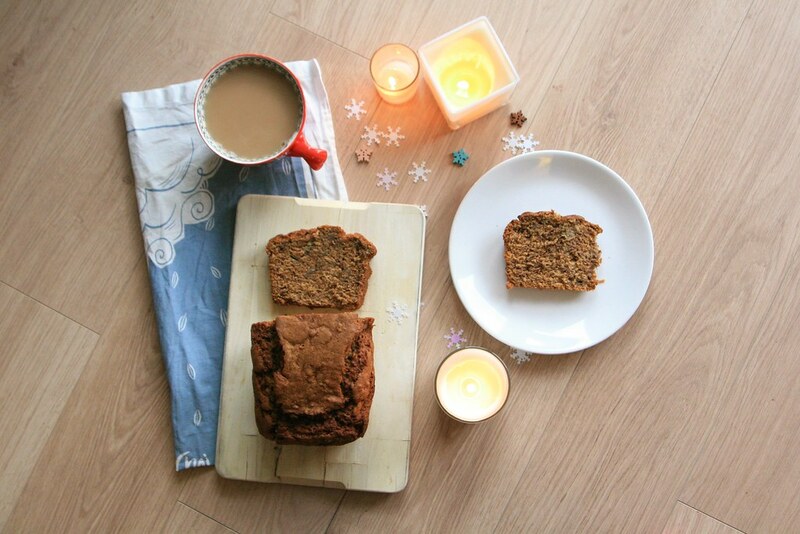 I opted to use gingerbread rooibos chai to give the loaf an extra festive touch, but I think pretty much any chai would work like a charm. I also added some ground ginger and cinnamon to my recipe, but that's mainly because in winter I have a hard time restraining myself from adding ginger and cinnamon to everything. I did find that it actually took me longer to bake it than the specified time in the recipe, but covered the top with foil to prevent it from browning too much and checked on it every 5-10 minutes, skewering through the middle until it had all cooked. 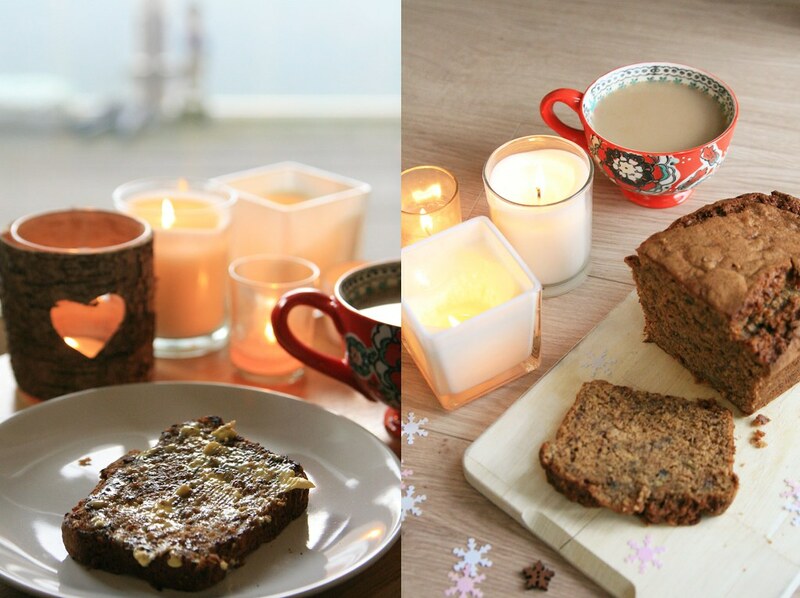 The whole flat seemed to fill with the scent of fresh baking, banana and cinnamon. I hovered by the oven, waiting for it to be done. And then had to leave the loaf cooling on the rack untasted as I was going out. Heartrending. 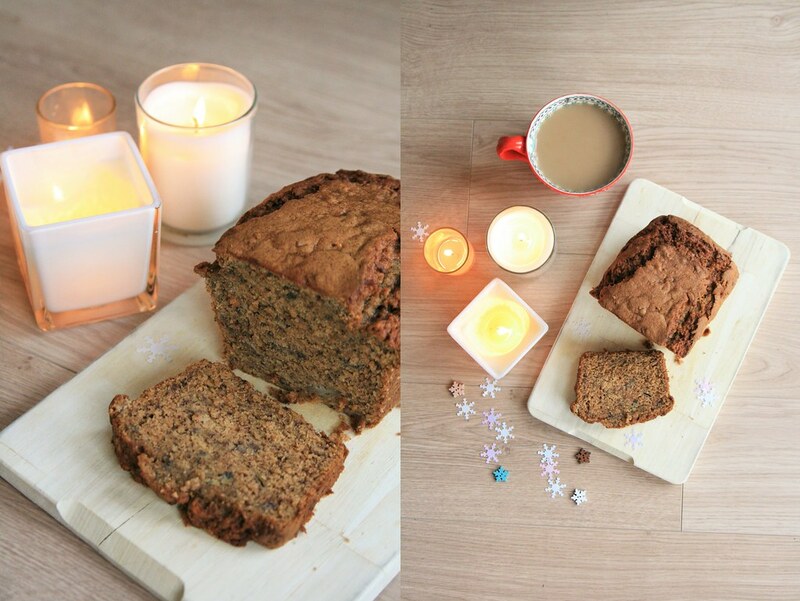 Good things come to those who wait however, and for almost a week, my evenings ended in cosy delight, snuggled up with my camp blanket on the sofa, lights a-twinkling, candles lit, a cup of tea at my side and slice of warm, toasted banana bread slathered with butter to indulge in. It was so good. On a practical note, I sliced up the end of the loaf, wrapped each piece in greaseproof paper and froze them, and the cake has defrosted very well. A great way to preserve those last few slices and make such a tasty treat go further. I even saved a slice for the Man, who was away with work at the time, and we had a piece each for brunch one morning. Sharing is hard as I don't like to give cake away. But apparently it makes you a better person or something. Anyway, I particularly enjoyed this recipe; it's nice to have a dessert you can serve warm when winter temperatures plummet and I will certainly be adding this particular cake to my repertoire. P.S. This post is one of my December series inspired byShimelle’s scrapbooking class Journal Your Christmas. My aim is to blog every day throughout the month to document all the little moments that make the most wonderful time of the year. Merry Christmas! Oh that gingerbread spiced chai sounds amazing! I may have to order some of that for a Christmas treat for myself. I saw on the Scrap Gals that you posted your blog info, so thought I would pop in for a quick visit. I like that you are recording your memories along with your pictures here on this blog. It will be easier to put together your scrapbook, if you decide to do a physical print version.